The best gold discovery in a century is happening right now, in remote Australia. And this could be the tip of something much bigger. So how big is it? Workers at the Beta Hunt Mine used a single blast of dynamite to break free a cube of earth that’s 3 meters on each side. Within that, they found 9,000 ounces of gold. That’s worth about $11 million. Some of the gold is in large lumps, as you can see from the photo below. Henry Dole, the miner credited with finding the gold, said, “Never in my life have I seen anything like this. 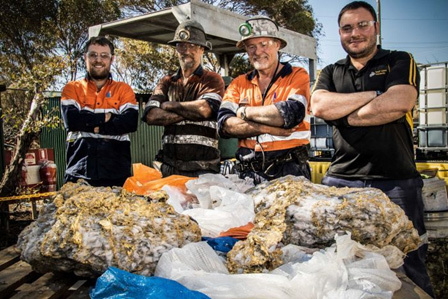 There were chunks of gold in the face, on the ground — truly unique, I reckon,” according to the ABC News report. The Beta Hunt Mine normally produces ore that contains around 2 to 4 grams of gold per metric ton. But the latest find contained 2,000 grams of gold per ton. 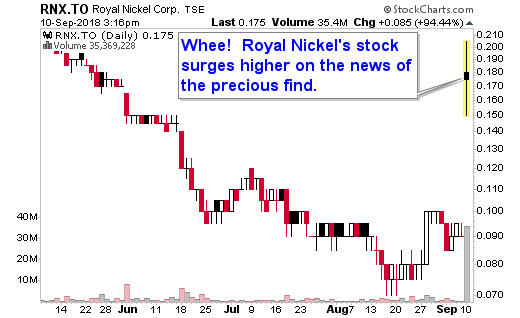 Now for the crazy part: The company that owns the Beta Hunt Mine, Royal Nickel (TSX: RNX), wants to sell it. Royal Nickel has been trying to sell it since April, in fact. And it says that this big gold find is nice, but that doesn’t change its plans. The share price of the company already doubled on the news of this precious find. As the name might tell you, Royal Nickel considers itself a nickel company. In fact, its most recent presentation talks about its nickel and cobalt projects before it finally gets around to Beta Hunt and the gold mined there. Beta Hunt contains nickel as well. Royal Nickel wants to sell Beta Hunt to help raise $1 billion to develop its planned Dumont nickel mine in Quebec. Beta Hunt is underground, and that kind of mining is expensive. It’s an all-in sustaining cost of $1,230 per ounce. To put that into context, the current gold spot price is $1,194.90 per ounce. In other words, it’s losing money at present prices. Though this precious find may change that. The billion-dollar question is whether this vein runs far, or if it will “pinch off” soon. But reports from the field — whispers, really — say that, dating back to the early days of the mine, similar bonanza finds were made. But because of low gold prices, those finds weren’t considered important. Then there’s the fact that Beta Hunt was really focused on nickel. So, Royal Nickel is selling. Who might buy the mine? It hasn’t had any takers so far. But one clue — missed in the news reports I’ve seen — is that the mining tenements on which the Beta Hunt Mine is located are held by Gold Fields Ltd. (NYSE: GFI). Gold Fields is trading near a 52-week low. This is a company that could desperately use a hit. Especially one outside of South Africa, where most of the company’s operations are now. So, I would keep that in mind as this goes forward. This once-in-a-lifetime discovery could be the opportunity of a lifetime for someone. Gold is wonderful and it is very good to hold, however, with equities on the edge of a market when stocks are so very high, and have been bid up over the last 10 years, many believe an adjustment downward is due. So when this happens, stocks will drop in value, and the good stock, will be sold with the not so good stock, by the existing owners. So if one purchases stock in anything now, be ready for a reduction in price with that same adjustment. What is explained here happened in the last market adjustment downward so it will happen again. Ask yourself are you ready to hold a reduced stock for 5 to 10 years to break even as is the case? in history??? The only think to hold is the hard asset, the coin of gold, or the chunk of gold, not the gold equity. If you scoff at this informaiton be very careful, and do not place large sums into this that you can not afford to hold for a long, long time.